The Mysterious Egg can be looted from a Wiggling Egg, which can be found in a rylak nest in Grom'gar, Frostfire Ridge. To reach the nest, players can climb the large snow mountain and drop down onto the roof above the Thunderlord Clan base. From there, jump down to the platform where the rylaks are resting. The nest containing the Wiggling Egg can be found under the small overhang on that platform. Players can loot the Wiggling Egg only once per character. comment stolen from Wowhead "Found at 64.4, 65.9 in Frostfire Ridge, ABOVE the Thunderlord Clan base (the Huge dead Grom) and in the nest you will find the Mysterious Egg that gives you this item (after 3 days)." I feel bad for everyone low-balling his appearance rating. He's got that wicked Jurassic Park feel about him. This is a cool pet. First off it has the same move set as the other toucans so it will be as lethal as its counterparts when facing aquatics or even in general with the right team. 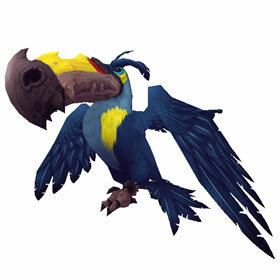 Plus this toucan has my favourite colour scheme, provided with the name fruit hunter. It reminds me of the fruit loop toucan.. probably cos of the name. Cool pet to be in my favourite collection. Follow your nose wherever you go! Why is it a toucan rather than the Rylak that are around their, seems a bit random. I went with a friend and we both could loot it. It doesn't appear to have a reset timer (but the tooltip says it can only be looted once per character). Got mine yesterday before being kicked off my server, pretty easy, just run around the back of the place and up the snow ramp to the platform to the coords of the previous post, and there it was wiggling away in the nest (due to either addon or server error I couldnt see it in my bag til relogging) assume its like the raptor in duswallow marsh, may have a respawn timer. This pet is hatched from Mysterious Egg, which turns in to Cracked Egg. The Mysterious Egg is location at Grom'gar in Frostfire Ridge around 64, 65. You can find the egg above the base entrance on a platform with Thunderlord Driftstalkers. The egg will be in a nest towards the back of the platform with the tooltip "Wiggling Egg". It hatches after 3 days and you will recieve Fruit Hunter. Edit: My egg hatched this morning! Uncommon quality, Cageable, and P/B breed. This anxious avian has a voracious appetite for fruit.